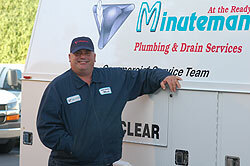 Celebrating 30 years in business, Minuteman has a proven track record of dependability. What makes Minuteman Plumbing different from most other plumbing and drain companies is that we almost exclusively focus on business in the commercial market. Our staff is specially trained and comfortable in a large commercial facility environment. We understanding the regulatory (health department, city, OSHA) pressures of our customer base. Our technicians work on commercial fixtures like; hands-free sloan valves and faucets, high recovery hot water heaters, circulation pumps, mixing and temperature issues. We specialize in serving restaurants, management companies, retail stores and other commercial properties. If you are located in southern California and have specialty plumbing needs, give us a call.